Monday we left Eads, Colorado under a blue sky with calm winds. Happily these conditions persisted for most of the day with the exception of the last few miles when the afternoon thunderstorm began to blow in. 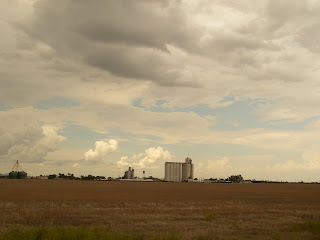 One of the things about cycling on the plains is that you can see the grain elevator of the next town for miles and it seems like forever to get there. 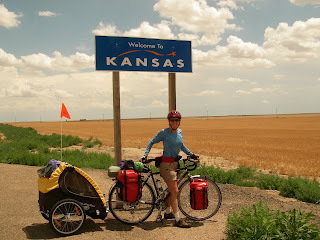 We passed out of Colorado and into Kansas. The road immediately seemed flatter somehow. We got into Tribune and our motel room just before the thundershowers began. Our motel (the only one in town) is the seediest motel we've stayed in for many years but we were glad to be out of the weather. The couple in the room next to us are on bicycles as well but are heading west. They are Jerry and Lynne. Jerry has been on the Biggest Loser tv show and lost 300 lbs. He promised himself that if he lost the weight he would ride across the country, and here he is! Congratulations, Jerry! 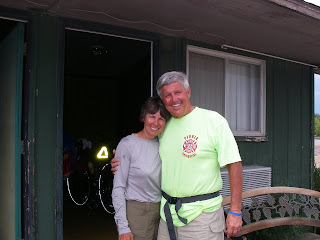 They are two of the nicest people, they are raising money on their trip for a childrens home. Visit their web site at http://www.jerrylisenby.com/ .